Our prayers have been answered and they come in the form of sheet pan gnocchi. This is our newest obsession. When I say obsession, I mean this is serious obsession. Why I never thought to throw gnocchi on a sheet pan and roast it to perfection? While cherry tomatoes burst with flavor and peppers and onions get all caramely and golden? Think of an easy and fast meal that tastes different from all the other easy and fast meals you make. This is it! My oh my, what do I love about the sheet pan gnocchi? It can be a side dish. A side dish to just about anything, really! Pair it with grilled chicken or even a salad or salmon. But for most, it can be an entire meal. It’s like a roasted veggie pasta and it’s simply delightful. And if you’re really feeling it, you can always add something like smoked turkey sausage to the pan too and roast it right along with the gnocchi and the veggies. It is such an easy meal. Embarrassingly easy, actually. Yes those are my favorite kind, of course. With a drizzle of olive oil, lots of herbs (fresh and dried), some garlic and seasonings and a sprinkle of cheese, it’s super flavorful. So much more than I would have anticipated. The gnocchi also get this slight crisp to the outside. You know I love that! It’s a toasty little bite. Not super crispy, but toasted to perfection! And P.S. you can also do this with Trader Joe’s cauliflower gnocchi! More in the recipe card below. This sheet pan gnocchi is also one of those meals that is perfect for nights when you get home from work and need to prep something quick. Throw it all on the pan (you can even chop your veggies ahead of time, like on Sunday or the morning of!)! Let it roast and get all flavorful while you do a few things around the house or binge a couple youtube videos, and then boom. It’s done! This easy weeknight dinner is ridiculously palate pleasing. Sheet pan gnocchi is an easy meal that the whole family will love! 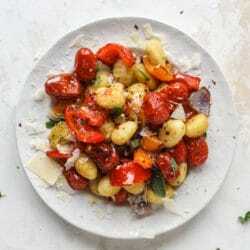 Toasted gnocchi along with burst tomatoes and caramelized peppers makes the best dinner. Preheat your oven to 425 degrees F. Line a baking sheet with aluminum foil and spray with nonstick spray. Spread the gnocchi, tomatoes, peppers and onions on the baking sheet. Drizzle with the olive oil. Sprinkle with the garlic powder, salt, pepper, oregano, basil and crushed red pepper and toss well to combine everything. Make sure everything, especially the gnocchi, is seasoned well! Roasted for 20 to 25 minutes, tossing once during cook time. You want the tomatoes to be bursting and the peppers to be soft and caramely. Serve the gnocchi immediately. Sprinkle with the parmesan cheese and a sprinkling of fresh herbs! To make this with Trader Joe's cauliflower gnocchi: make sure your pan has nonstick spray on it and that the gnocchi are not clumped today. You do not need to defrost the gnocchi, but make sure any large pieces of ice or freezer burn are removed. I roast for about 25 to 30 minutes with the TJ's cauliflower gnocchi. The outside may not get quite as crisp and toasty as potato gnocchi. That caramely golden goodness. I can’t! Oh yes, this dish deserves an AMEN! yum! wonder if this would work with trader joe’s cauliflower gnoochi..! ah i meant to include that in the post. it does!!! check it after 20 to 25 minutes but it might need a few more! I was wondering the same thing! Would you need to thaw the cauliflower gnocchi? Or just put it on the pan frozen? just put it on the pan frozen!! as long as your bag is fairly new (and therefore doesn’t have a lot of ice buildup or freezer burn) it should be fine! Okay guys I just retested the TJ’s gnocchi really quick. The only things to be sure of are spray the pan with nonstick spray and remove some of the ice buildup (if you have it). Otherwise, it works super well!! Aw you’re the best for retesting!!! Thanks! Can’t wait to try this! Jess, this looks ridiculously delish! 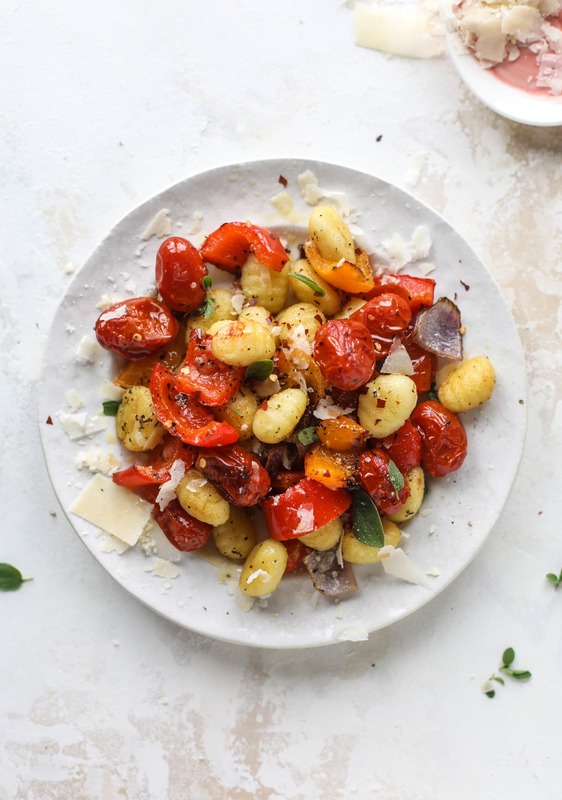 I have a serious craving for this now, but I also have what I think may be a silly question – do you need to boil the gnocchi before you pop it in the oven with the veggies? nope!! you literally dump it right from the bag or box! Looks delicious; trying it this week. Always love easy dinner recipes. Thanks! This looks fantastic! We have a big batch of gnocchi in the freezer that we made at Christmas. It was frozen uncooked. Can I use this? Defrost first? i used shelf stable, but the recipe that i adapted this from (from the kitchn) says you can use shelf staple, fresh or frozen! i definitely think you can use it right from the freezer. the only thing i would check on is to make sure it doesn’t have a lot of ice buildup or freezer burn or anything that could melt in the oven? that would make the ingredients steam instead of crisp up! Yes!!!! Obsessed with this easiness!! Did you use the shelf-stable gnocchi or frozen? i used shelf stable, but the recipe that i adapted this from (from the kitchn) says you can use shelf staple, fresh or frozen! so i think you can use it right from the freezer. the only thing i would check on with using frozen – make sure it doesn’t have a lot of ice buildup or freezer burn or anything that could melt in the oven? that would make the ingredients steam instead of crisp up! I have a ton of pesto frozen from this summer…last night I was looking for a roasted veggie recipe to use some of it up. This looks PERFECT – I’ll toss it all with pesto after it’s roasted. Yum! I tossed it with pesto, too! I also added Trader Joe’s spicy italian chicken sausages sliced up for protein. Can’t wait to make again! EASY PEASY. yay!! this makes me so happy!! Oh gosh, this looks DELICIOUS, but now I’m torn… I have to ask, honestly, how much less delicious is the cauliflower version of this? Is the classic gnocchi so much tastier that – hey, it’s still healthy enough – I should just stick to it? Or is the cauliflower version actually still so reasonably delicious that I should just be ridiculously healthy as I promised I would be? the cauliflower version is still REALLY good!! the thing i find is that the TJ’s cauli gnocchi tastes exactly like cauliflower. so i think it depends on what kind of flavor you’re going for! Wow you were so right! The first time I made this, I did half regular gnocchi half cauliflower, and I think I might like the cauliflower version even more! I say “first time” because I’ve made this 10 times since…! It’s definitely my new favorite way to make the cauliflower gnocchi because I’ve never gotten it to become nice and crispy any other way. Literally making this all the time now! And it’s so easy to slap a runny-yolk fried egg on it, which makes everything in life better. OH MY GOODNESS! I make a grilled summer vegetable pasta and it is hands-down my favorite summer meal, but there is no way I am going out to grill in mid-January. This dish totally reminds me of it, but would be such a fantastic winter version! I am so excited to try it! Made this tonight and it was amazing! I used some potato gnocchi, and shone of the TJs sage sweet potato gnocchi and it was great. Will have this on rotation! so glad you liked it bex! Is there a particular store brand of gnocchi that you use? I’ve had bad luck with storebought gnocchi in the past. This looks delicious though! i used the delallo foods brand!! they have regular potato gnocchi, whole wheat gnocchi, gluten free gnocchi and mini gnocchi! What an idea to prepare gnocchi in a sheet pan :-) love the idea. Obsessed too, don’t worry, it’s OK :-) Grazie milla ! Halleluja! This was one glorious recipe. I admit I can’t EVER exactly follow ANY recipe but luckily my alterations were minor tweaks, letting your delicious creation still shine. I used two pounds of Dececco brand gnocchi, onion, fresh broccoli, red pepper, fresh rosemary, southwest spice blend sold by Vitamox, I can rotel tomatoes with green chilies, and grated fresh parmigiano cheese when came out of oven. My vegetarian son and I might fight over the leftovers, lol. Thanks so much for one of the best fast, tasty dinners of all time! that sounds so so good!!! This both looks and sounds incredible and the roasted veggies always brighten up any recipe with great flavor, color and nutrition! HI! this looks so good! I do not have the gnocchi, but do you think I could substitute it for some frozen mushroom ravioli from my freezer? Or would I have to cook it before-hand and then bake it? i am not too sure about the ravioli with a filling since i haven’t tried it. but.. i feel like it would work?! I made this for dinner tonight and was blown away at how delicious it was. Seriously, I could have inhaled the entire pan by myself. It was so easy and so yummy. I know I am going to make this over and over and over. Thanks soooo much for sharing!! 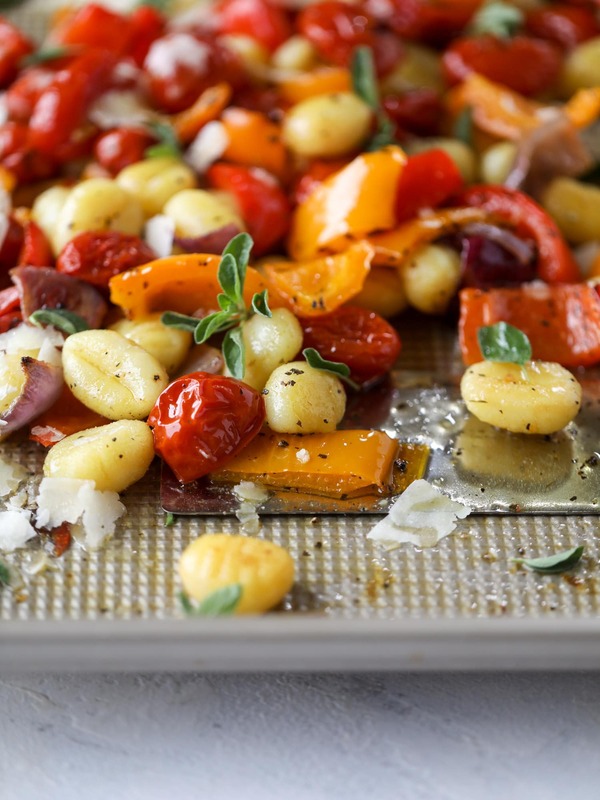 sheet pan gnocchi and roasted vegetables for me and this recipe rocks! If I wanted to make 10, would the best way Be to make 5 batches of 2? I just made this and it was so good! My three year old and one year old both loved it, and it was so easy to make! This is going to become a dinnertime staple for sure. MY PICKY, “CAN I JUST MAKE MYSELF A SALAD,” TEENAGER HAD 3 HELPINGS! She loved it! This recipe was so tasty and will definitely be put into the regular rotation. We made is exactly as written and had it with broiled salmon. I can’t wait to have the leftovers for lunch. Thank you for so many amazing recipes! Great flavors and I love that it comes together so quickly. Thanks for the recipe! Just made this with sweet potato gnocchi – it was delicious. I’m so glad to have this new technique to use! Thoughts on popping in some fresh Shrimp about halfway through? Or could they last the 20 mins in the oven? I made this last night with mushrooms and threw some shrimp in halfway like I said here and oh man was it tasty!! Even my burger loving boyfriend went in for seconds! I love when that happens… except that it means I don’t have any leftovers for lunch! yum, thank you! Hi I need to make this for a potluck. Do you think it’s okay to make it on Thursday and reheat it for Friday supper. Will the gnocchi clump up after being in the fridge? Any instructions on reheating? I just need you to know, my boyfriend and I make this almost weekly! It’s our fave! So easy and sooo good. We’ve added other veggies we have on hand too. Perfect for leftovers! Thank you for the recipe! This is my second time making this and it is so, so, so good! I added some frozen TJ’s meatballs as well for some protein. It also reheats perfectly for meals throughout the week. Thanks for another amazing recipe to put in my weekly rotation Jess!! 3) It makes everyone happy. In our house, we have one vegan, one vegetarian, one with a dairy allergy and one omnivore. It is so hard to find recipes we can all enjoy, but this one did! 4) Clean up is a dream. I threw the tinfoil away and DONE. Made this tonight! This. Is. Incredible! Thank you for posting this. Will definitely be in my rotation. WOW! Sounds delicious! Would you have the nutritional info? Thanks. Made this tonite and it is as delicious as it is pretty. And easy too! Thanks for the recipe! I was thinking of adding in pieces of chicken or slices of chicken sausage to the recipe. Would I have to precook the chicken or the sausages or could I put them on the pan and bake from raw? I can’t wait to try this!